Triumph has removed the Speed Triple streetfighter from its official Indian website. While Triumph has refused to comment on whether the Speed Triple has been discontinued from the Indian market, this move seems like a precursor to the launch of the 2016 model, which was unveiled at the 2015 EICMA Show. As the Speed Triple is imported as a completely built unit from the UK, the halt in production of the old model at Triumph’s Hinkley facility will directly affect the supply in India. With the other global markets moving to 2016 model, we can expect the company’s India operations to follow the suit. While a few dealers are still accepting orders of the current Speed Triple, these might be among the last few remaining models. Triumph says that the new Speed Triple models are different from their predecessor in 104 ways. The new Speed Triple is powered by 1050cc three-cylinder engine that delivers 140bhp and 112Nm of torque through a six-speed transmission. Cosmetically, the Speed Triple gets a redesigned headlamp with DRLs, new seats and a sleeker body. It also gets a slipper clutch, ride-by-wire throttle and a redesigned exhaust. 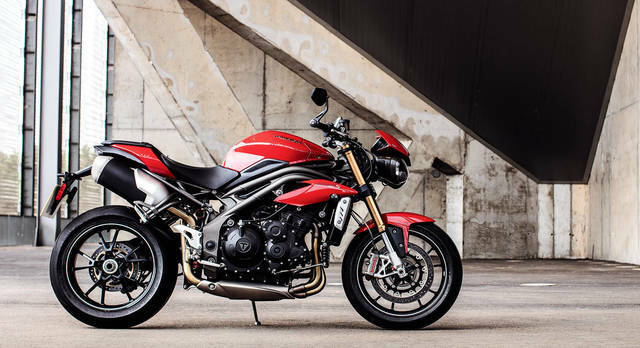 There is a possibility that Triumph will showcase the new Speed Triple at the 2016 Auto Expo, though there is no official word regarding the same. The Speed Triple competes with other litre-class streetfighters like the Kawasaki Z1000, Suzuki GSX-S1000 and the Honda CB 1000.